We went to bed, and like normal, I woke up in the night to go to the bathroom. This time it was about 3:00a.m., and I quickly went back to bed. As I was drifting back to sleep, I felt a gush of warm liquid. I finally accepted the fact that my water had broken. I woke Daniel up to let him know, we cleaned things up, and I told him to get his rest now because we didn’t know what was ahead. (In my last 2 births, my water broke in the later stages of labor during hard, hard contractions.) At that point I was not having any contractions, and having just read this article on the importance of the amniotic sac in labor and with that fresh on my mind, I have to admit that fear started to creep into my mind. Since I was sleeping with a pillow between my legs, this would also be the demise of pillow #1 (a theme in this birth). I quickly sent a text to my friends Ashlyn and Kristen, as well as my midwife, Carey, and my doula, Julie, just to give them a heads up that my water had broken, but that I wasn’t having any contractions. I was excited and nervous at the same time. I knew having my water break could also mean that contractions might start coming fast and furious, and that I could potentially have another precipitous birth like my last. Mild soon turned into manageable and I did a lot of hip swaying to get through these contractions. They soon progressed into “difficult to talk through,” so I jumped into the shower for comfort. I also e-mailed my friend Kristen and asked if she could come sometime between 7 and 8a.m. and then stay until her husband had to go into work later that day. 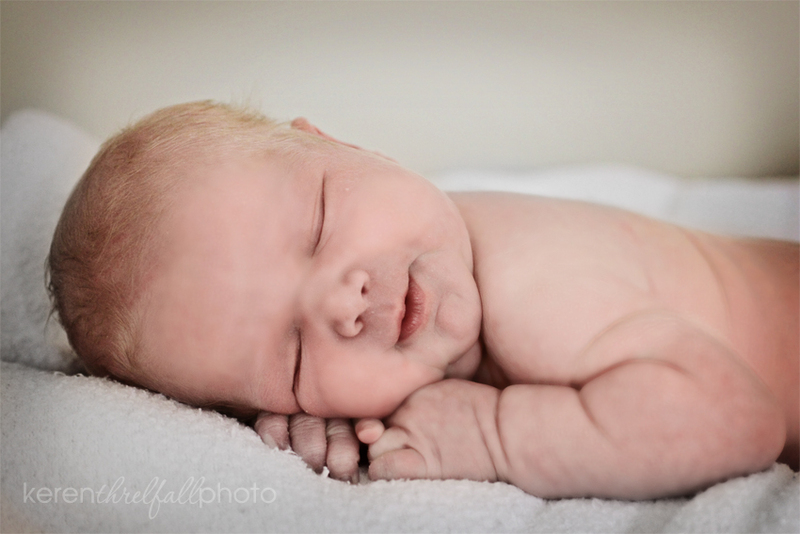 Around 6:50a.m., I asked Daniel if he could go ahead and call Julie (doula) to come. A few minutes later, I told him he probably should call Carey (midwife), as well. By this time I was beginning to grow frustrated and impatient. While my contractions were coming harder and more steadily, it still felt soooo slow compared with my last labor. Multiple times between pressure waves, I told Daniel that this was incredibly boring and slow. At 8a.m., I was sitting on an exercise ball during contractions. My leg and hip muscles felt tight all over, so I drank a Gatorade to get some electrolytes and tried to eat some apples that Daniel sliced up for me even though I didn’t feel very hungry. Carey arrived a few minutes later, and my friend Kristen and Julie came in shortly after that. Kristen took over caring for the girls (along with her little 4-month-old girl), and the girls were very excited to spend the morning with “Miss Kristen.” Carey came in to check my dilation. I tried to be a realist, and set my expectations low. I prayed and hoped I’d be at least 2cm. It’s good I wasn’t hoping for higher, because Carey measured me at 2cm., but stretchy to 4cm. That was okay with me at that point. This was the first time I had an internal exam this pregnancy. Around 10a.m., Carey and Julie came up to check on us and suggested that we go ahead downstairs. They had the tub filled. Around 10:15-ish we headed down. I got in, and the warm water felt great. It definitely made contractions feel better, but as they intensified I knew I didn’t want to be laboring in a sitting position. I really wanted to be able to be in a hands and knees position, but with something supporting my upper body. In addition, I started getting painful muscle cramps in my hips and the arches of my feet. I thought to myself this was likely an electrolyte shortage, so I tried to keep on drinking Gatorade. We tried various things, and eventually we got one of the girl’s tall plastic stools. Of course, it was hard and still a bit uncomfortable; but it was the perfect height. I was already sitting on some folded towels to make a cushion, and in this position needed them for my knees. So? We grabbed a pillow and put it over the stool. (Death of pillow #2 by drowning). Ahh!! Relief! The hands and knee position in the tub was definitely a good position, but there wasn’t enough room to really stay in it and fend off the muscle cramps. In my mind, I kept thinking how slow things were going and just felt like I wasn’t making progress. Much of this was likely because I’d experienced things so quickly with Eden’s precipitous birth, but it was nonetheless discouraging. I continued to get muscle cramps in my hips, and the Gatorade wasn’t accomplishing anything noticeable. I continued to grow frustrated and impatient. Several times, Daniel prayed, sometimes out loud. I began to pray that God would allow the baby to arrive by noon. I got out of the tub, and tried to sit on the toilet, in hopes also that this position would encourage the baby to move down. I tried to “spin” through some other contractions, and verbally cried out to God for mercy and safe passage for this baby. Soon, I felt like just giving up and crying. The pain was extremely intense. It was now 12:26p.m. The thought did cross my mind, “could this be transition?” But it wasn’t like before during Eden’s birth, when I could clearly detect my body moving and working through this different phases of labor. With both Hana Kate and Eden’s labors, I started vomiting when I hit transition, but I wasn’t feeling that way. I told everyone that I felt like I might cry, but that I didn’t even fully know why. And that I hardly ever cry. But then, I did cry. It was weird. We thought that after I was finished crying maybe my body would move on to the next phase, quickly finish dilating, and push for a few minutes and have a baby. This isn’t what I’d envisioned, at all. It wasn’t what I’d prayed for. I was very discouraged. And embarrassed. I’d attended my friend Kristen’s labor with Carey in January, and she had birthed so beautifully. I loved working with Carey and Julie, and I was embarrassed that I wasn’t even that far along, but that I’d already power-yelled through contractions, and now that I’d cried. I felt so weak, physically, emotionally, and spiritually. And something just felt wrong. I began to get a slight pushy sensation with my contractions, but not very strong. At this point, Carey decided to check my dilation again. Unbeknownst to me, she held up 5 fingers to Julie, signaling that I was only dilated to 5cm. She felt it was best not to tell me (and I was glad she didn’t, given my discouragement). She also told me that I had a rather large cervical lip. Normally cervical lip should be tissue paper thin, but mine was quite thick and swollen — maybe around an inch or more. She worked to push it back a bit, but that was rather…umm, excruciating. I labored more, not making any progress. There was just pain. The pushy feeling was increasing slightly, but it still just felt “wrong.” Carey had me get out of the tub and into a knee-to-chest position on the bed in an attempt to lift the baby off the cervix (in hopes that the head could reengage and the lip would go away on its own). Of course, not only did I have to be in this crazy position, but I was also not supposed to push during the contractions. That was a bit challenging, but it was about to get a whole lot more “challenging.” In other words, I experienced the worst pain I’ve ever felt in my life, and I have given birth twice before. At this point, Carey decided to reach in and try to “hold back” the cervical lip with her fingers. Even before she worked on it, there was a lot of blood. This was from my cervix being so swollen. Of course, I was still in the knee-to-chest position, and I was trying not to push during contractions. Oh, and then, yes, the muscle cramps came back. Finally, it became nearly impossible to resist the urge to push. Eventually, Carey said I could go ahead and try. Still, the urge to push was not quite as strong. Every time I pushed, I felt like something in my body was resisting the push. There was the cervical lip (and Carey’s hands in there), but it still felt like something more. So, I pushed as hard as I could with Carey’s hand in me. It was exhausting and incredibly painful. I couldn’t make it through it without screaming/yelling as hard as I could. At one point, Carey told me something, but I didn’t even hear her. I was a bit irritated by whatever it was, and Julie explained that there’s no way I could have understood her at that point. I was very exhausted at this point. I saw Daniel, and he seemed so strong and calm, and so did Julie. (I couldn’t see Carey as she was directly behind me.) Every once in a while, I saw Ashlyn taking pictures. I felt bad, because she had had a difficult labor with her previous birth, and it was at the point of pushing that things got stuck for her, as well. But she seemed calm and composed, as well, and that was reassuring to me. I began to seriously question whether or not I would be able to push this baby out. My strength was fading, and the pain was almost more than I could bear with Carey working on moving the cervical lip. I kept pushing, and asking how much longer I needed to be in the knee-chest position. Carey kept saying something like “I think we’re going to have a baby soon.” Eventually, she asked me if I could get on my back, so she could better work with pushing back the cervical lip while I tried to push with it. I also knew I would had to be careful with how far I let my knees get apart from each other with the SPD. On my back, I pushed as hard and long as I could with each contraction. Meanwhile, Carey continued to hold back the cervical lip and asked me to focus by trying to push her fingers out of the way. Soon, I was told the baby’s head was crowning. I was told to reach down and feel, but I don’t think I realized I really was finally to this point. I continued to push, but on my back I just felt odd, and I told Carey that it still didn’t feel very good to push. So, Carey, Daniel, and Julie all grabbed my arms and helped pull me from being on my back to being on hands and knees. I continued to push with each contraction, yet it still felt odd. They told me I was making progress, but I felt like giving up. The “ring of fire” sensation began before the head was out, and this was confusing to me. I was so excited to feel it, but was disappointed when I learned the head was not even out. My energy was fading, and I wasn’t sure I was going to make it. With the next contraction, I pushed and long and as hard as I could, and the baby’s head was out!! I was relieved, but disappointed that the rest of the body wasn’t born along with it. Baby’s head grew increasingly purple (I have some pretty amazing pictures of this part). Ashlyn later told us that while just his head was hanging out, she saw mucous and liquid pouring from his nose and mouth. This is one of the amazing things that happens during birth as the baby is squeezed through the birth canal (and a reason why C/s babies sometimes need respiratory help, since they don’t get the “squeeze effect”), but it was neat to see/hear just how much fluid gets squeezed out! Finally, 4 minutes later, the rest of the body was born at 2:14p.m., into Daniel’s waiting hands. Justus came out with a very pale body and a purple head. His muscle tone was very weak, and his initial Apgar was just a 6. But he quickly pinked up, started breathing well, and quickly was a very red baby. Carey and Daniel worked to untangle Justus’s cord and pass him through my legs so I could hold him. Carey and Julie were both saying how big he was, and Carey said that he had to be at least 9 pounds. I felt no pain those first ten-ish minutes and just cradled him in my arms (though I did feel rather pregnant still). About 10 minutes later, I felt the urge to push out the placenta. I rose back up to my knees and birthed the placenta at 2:26p.m., and we cut the cord shortly thereafter. (Yet another pillow was destroyed at this point–birthing the placenta is when things get really messy!) At this point, the afterbirth pains hit me like a semi-truck, and I requested all the medicine available. Thankfully, I knew about afterpains from the intense ones I experienced after Eden’s birth (they usually get worse with each birth), and asked Dr. Stafford to write me a prescription for some pain medication along with my birth prep prescriptions. We also sent Ashlyn out to buy some Advil, which could be taken along with it. Once those kicked in about 30 minutes later, I felt wonderful again, albeit exhausted. I nursed Justus, Daniel introduced him to the girls, and we weighed him. Definitely over 9 pounds — 9lbs., 8oz., and 22 inches long, with a head circumference of 15.24 inches. (It was the head part that was huge!) Someone made me a PB&J sandwich and brought it to me along with some fruit. I was feeling quite weak and shaky, and Ashlyn fed me while I held and nursed Justus. (A true friend! ) Kristen was so gracious. I know she would have loved to have been by my side the whole time and been there the moment of the birth, but she sweetly stepped in to serve our family by watching the girls and doing some of the less glamorous work (all while hearing me go through the difficult labor, yet without knowing what was going on specifically). All told, this was certainly a challenging birth, and very far removed from my hopes and expectations. Had I been laboring in a hospital, the swollen, bleeding cervical lip would have been immediately responded to with a C-section (because there’s not really a means of taking care of it otherwise). 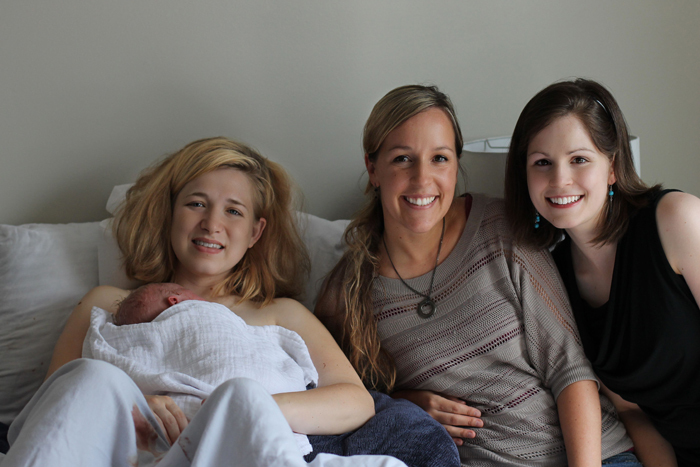 Being able to have postpartum visits by my midwife and doula was very helpful, especially in processing this birth. Carey told me she went home and cried after my birth, and Julie said she, too, felt very conflicted both during and afterwards. It was a traumatic time not only for me, but for those assisting. Everyone left around 5:00p.m. that night, though Kristen came back by and dropped off some soup from Panera, and then it was just our new family of five for our first night. I slept with Justus sleeping on my chest for the longest time. 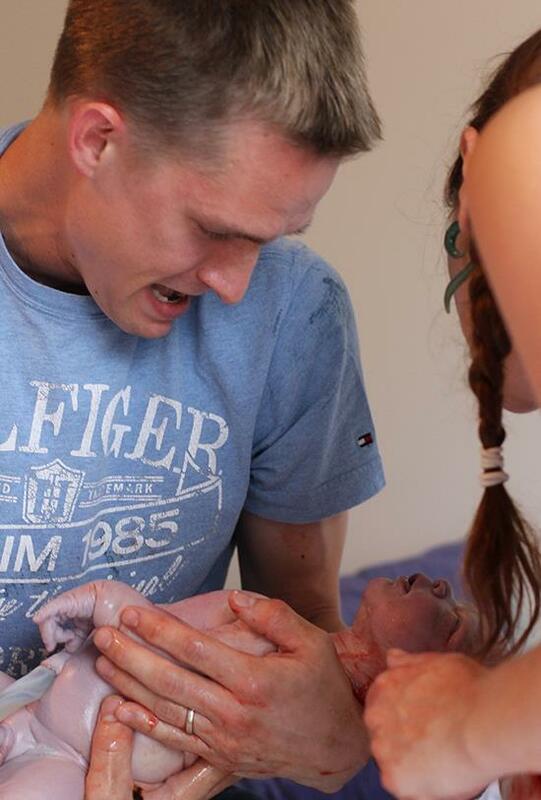 That’s a moment where baby only looks, feels, and smells that fresh newborn way for the first 24-hours. Wish I could capture it forever. Daniel took care of the girls, made them supper, got them to bed, and took care of me. Although I’ve always thought it would be great if I could have an unassisted birth (we almost accidentally did this with Eden’s birth. However, Amy, the one midwife who did arrive less than 30 minutes before birth did an amazing job somehow getting everything ready and making things go smoothly), I don’t think I even want to plan to give birth without a doula. I also want to make sure I have someone there to photograph if possible. Although most of the photos I have aren’t something I plan to share publicly, I am so thankful for the treasure of pictures my friend Ashlyn captured for us. Both for remembering precious moments, and also from a medically/physiological standpoint, I’m thankful to be able to look back and recall and inspect details that were already fuzzy just a few hours and days after this birth. 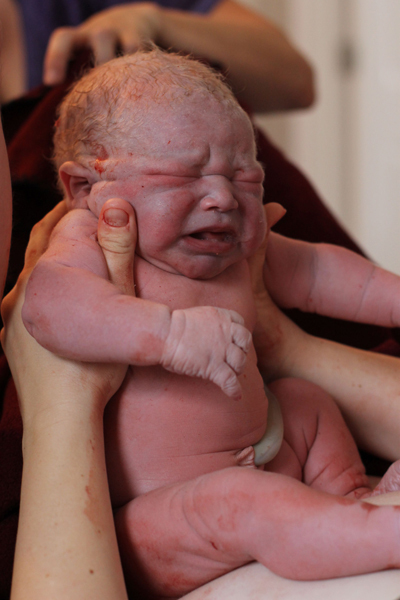 I still don’t feel like I’ve experienced a “typical” natural childbirth yet. I definitely believe I’ve experienced natural childbirth, as these things can certainly be a part of a normal and natural birth. But so far, I’ve experienced a 1) malpositioned (ascynclitic) baby that led to a long labor, 2) a precipitous 42+ week pregnancy, and now 3) a PROM, major cervical lip birth. Since I already have a record of atypical births, I think I’m going to start praying that if God grants us another birth and baby, it will be a silent labor (labor without feeling any contractions/pressure waves) and I’ll just hop into the tub, have the urge to push, and out will come a baby with nary a drop of sweat on myself. Oddly enough, I was completely aware of what was going on around me. Disappointingly, I never got into the “birth-focus-everything-else-ignored” phase like many often do during birth. Being able to have postpartum visits by my midwife and doula was very helpful, especially in processing this birth by discussing the challenges and frustrations that came with it. It really helped to hear Carey explain how she felt afterwards and what was happening from her perspective. 4 weeks out, I think I can say “It wasn’t that bad.” My 4-weeks-ago-self and those in attendance at the birth are probably rolling their eyes at me. But really, women’s bodies are strong (to which the others present wouldn’t roll eyes). 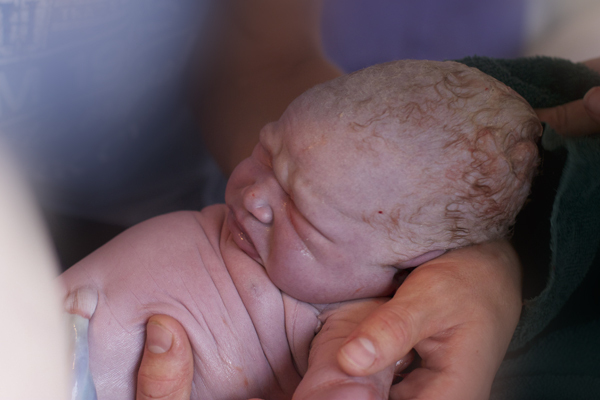 They handle normal, typical births beautifully (which is not to say that it’s not often quite intense). And even intense situations like these are quickly replaced with intense joy and gratefulness of birth and a new baby.